I found myself thinking back to Kingman, Arizona this morning. It was about seven years ago that I found myself living there for a couple of weeks while finishing up my flight instructor rating. I had an apartment I shared with a guy named Justin, a cheap rental car, and a daily commute to the north edge of town to sit in a classroom with half a dozen other students taking notes from a forgettable chief instructor while waiting for the wind or thunderstorms to clear. Did this every day, and every evening we’d head off our separate ways to hit the laundromat, buy groceries, or maybe endure a showing of whatever was playing at Kingman’s dilapidated cinema. Nobody really asked about where we came from; nobody asked what we were going to do once we left. It was a fine little life, but it didn’t actually feel like mine. It felt distinctly like I had stepped into someone else’s life, like I had enrolled in some budget form of a witness protection program and been handed these temporary colleagues, this temporary job, this temporary town. 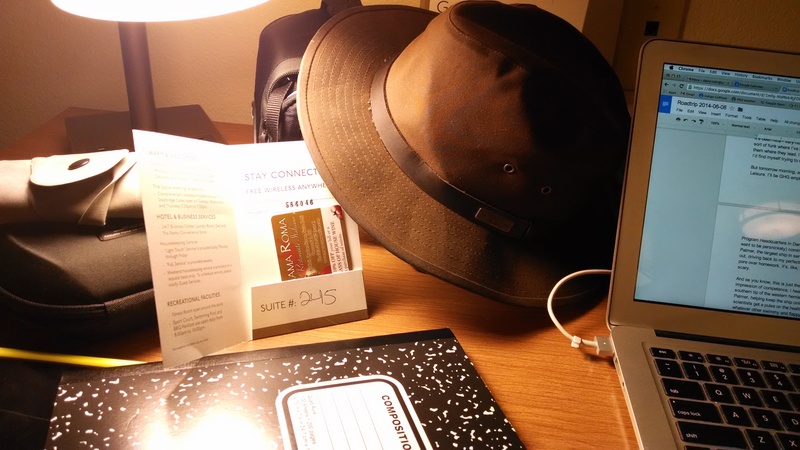 This evening, tucked into the comfortable if laughably-named “Staybridge Suites” outside of Centennial, Colorado, I felt that sensation rising up in me again. If you’ve been following the blog, you know I’ve spent most of the past year kicking around the house, being a writer, a traveler – honestly, somewhat of a layabout. And it’s been nice – very nice: the lack of a daily rhythm have allowed me to drift in a pleasant sort of funk where I’ve been able to watch the lazy perambulations of my mind and follow them where they lead. I haven’t been a complete slouch, you know, but more often than not, I’d find myself trying to remember whether today was a weekday. But tomorrow morning, all that is changing. I’ll no longer be David Cohn, Gentleman of Leisure. I’ll be GHG employee number god-knows-what, reporting for duty at US Antarctic Program Headquarters in Denver. I’ll be here the whole week, 9 to 5 (8:30 to 5:30, if you want to be persnickety) coming up to speed on the systems of the RVIB Nathaniel B. Palmer, the largest ship in service of the NSF’s Office of Polar Programs. Clocking in and out, driving back to my perfectly adequate corporate housing at day’s end to do laundry and pore over homework. It’s, like, you know – a job. Kind of exhilarating, and more than a little scary. And as you know, this is just the start. Next week, assuming I leave them with a suitable impression of competence, I head south: Punta Arenas, near Tierra Del Fuego at the southern tip of the western hemisphere. Then further south at Network Administrator on the Palmer, helping keep the ship online as the AMLR (Antarctic Marine Living Resources) scientists get a pulse on the health of Antarctic waters by measuring krill and counting whatever other swimmy and flappy things they can find. But the actual Antarctic stuff still feels like it’s a ways off. For now, the thing looming in my mind is just tomorrow morning. Honestly, it feels like the first day at a new school: will they like me? Will I embarrass myself? (“What do you mean you don’t know how to recalibrate a flux capacitor?”) Will I have even dressed appropriately? Yeah, in that part of my head that controls rational thought, I know it’ll be fine. I’ll do my best, and it’ll be fine, just like it always is. But the rational part of my head isn’t what’s going to be keeping me up tonight, is it? “First day at a new school” – perfect comparison. I am sure it’s going to swell! Good luck, Pablo – what an amazing adventure! I remember getting caught in a dust storm outside of Kingman, Arizona on a cross country bicycle ride. I can well imagine your life in that little town. Make some great memories in the frigid lands and let us all know how it goes! You’ll do great as always. Have a wonderful time. Once you’re on the Palmer, that whole “is it a weekday” thing starts again. And if you dress out of skua, you are sure to be in fashion. Looks like a cozy ship. Bon Voyage!